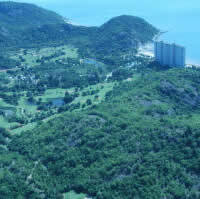 Milford Golf Club and Resort is built on the ocean in Hua Hin and is walled up by three hills covered in forest, its put together like your own secret valley oasis of Golf. However the course is quite difficult to play and requires precision shots to make par. The greens are very fast as well and have some very tricky and deceptive slopes. Even the local Pro’s have trouble on this course. The Clubhouse and Resort are right on the beach with panoramic views of the ocean, perfect place for a beer at the end of a challenging day of golf. The conditions of the course are average too poor so its best to check before you make the journey here.